Elon Reeve Musk FRS is a technology entrepreneur and engineer. 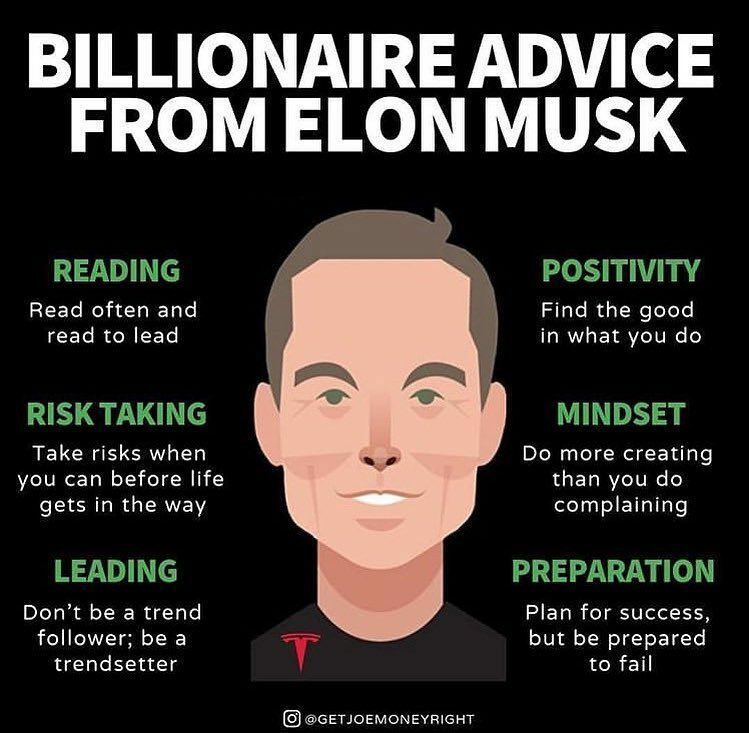 He holds South African, Canadian, and U.S. citizenship and is the founder, CEO, and lead designer of SpaceX co-founder, CEO, and product architect of Tesla, Inc. co-founder and CEO of Neuralink; founder of The Boring Company; and co-founder of PayPal. In December 2016, he was ranked 21st on the Forbes list of The World's Most Powerful People. As of October 2018, he has a net worth of $22.8 billion and is listed by Forbes as the 54th-richest person in the world. 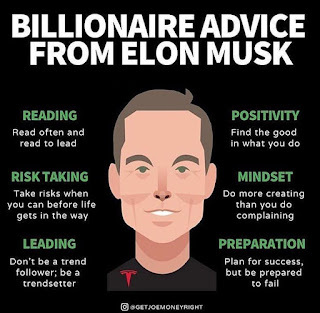 These are the top advice from the billionaire. 1 Read often and read to lead. 2 Take risk when you can before life gets in the way. 3 Don't be a trend follower, be a trendsetter. 4 Find the good in what you do. 5 Do more creating than you do complaining. 6 Plan for success, but be prepared to fail.